Hair Xpertise is a brand that never seems to get much coverage in the beauty world, but their haircare range is so impressive that they deserve some recognition. I've dabbled with a few of their products before - their Kera 10 Treatment is one of my favourite leave-in conditioners and their Argan Oil Treatment leaves hair so sleek that I'm always complimented on my tresses whenever I use it. 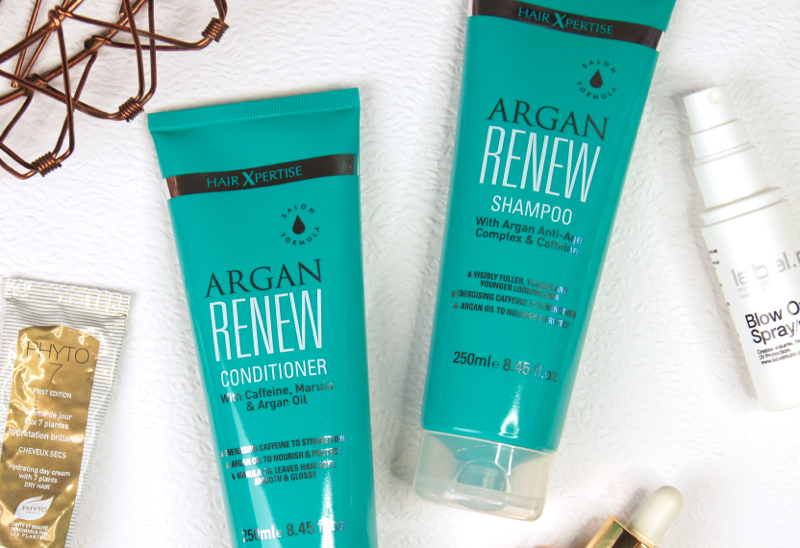 Most recently, I've been trying out the new Hair Xpertise Argan Renew Shampoo and Conditioner*, which are aimed at strengthing and protecting the hair, using an anti-aging blend of ingredients. As I'm well on my way to thirty, I've already started to think about ways to, not stop, but to slow down the aging process. Although my face is currently fine-line free, I want to keep it that way for as long as possible. So, I've started incorporating richer products into my routine, that are specifically designed to decelerate my skin's loss of elasticity etc. But, what about hair? The thought that hair ages has never really crossed my mind, before now. But, especially as my hair is so long and I don't envisage a drastic chop happening in the foreseeable future, it's something that I need to keep my eye on. As we age, our strands start to get finer, we experience hair loss, the rate of growth slows significantly and our barnet can end up lifeless and dull. 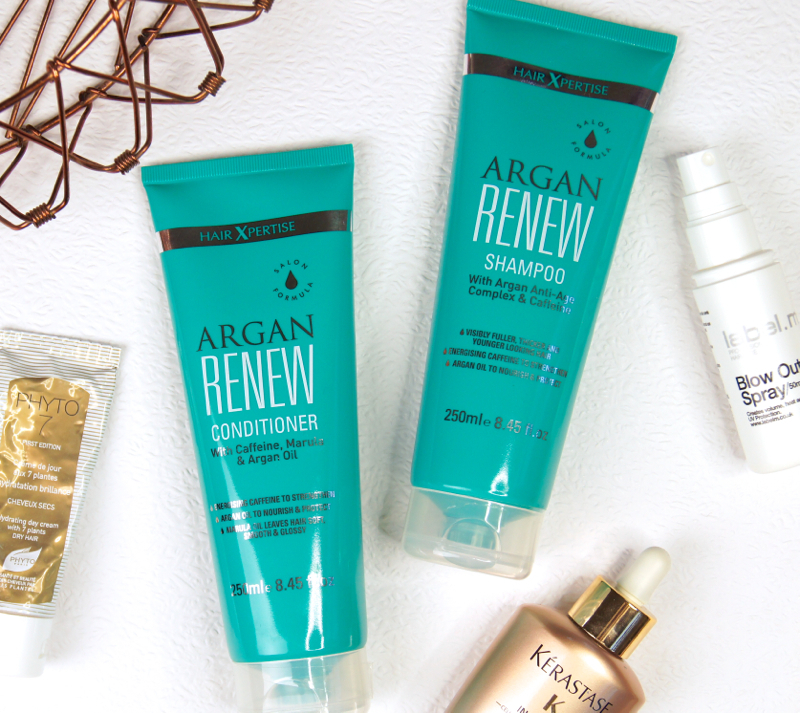 Although the Hair Xpertise Argan Renew products won't halt the onset of greys, instigate growth or reimburse any shedding, they definitely help to keep the hair strong, to prevent those unfortunate signs of age creeping up on us so quickly. Formulated with a high concentration of antioxidants, energizing Caffeine, nourishing Marula Oil and strengthening Argan Oil, this pair really works hard to invigorate, yet care for the hair, for a younger look and feel. Used regularly, the brand promise a visibly thicker and fuller appearance to the hair. Despite both the shampoo and conditioner being packed full of lush oils, they're both really lightweight. Usually, I opt for heavier, more intense formulas for my hair, as my locks are subjected to a torrent of abuse on a daily basis - constant heat styling, frantic brushing to get pesky knots out, colouring every so often and being thrown up into a messy bun whenever I'm at home. I've always thought that if I don't use a thick, substantially rich shampoo and conditioner, then I'm going to be left with flyways, frizz and a brittle mane to try and tame. Surprisingly, though, it turns out you don't necessarily need heavy formulas to work miracles on dry hair. The shampoo lathers effortlessly and really deep cleanses the scalp and hair thoroughly. Even on days when I've used a tonne of styling products and my roots are matted with tacky sprays, this shampoo makes light work of all the impurities. I do have to note that my hair does feel quite stripped of moisture straight after using the shampoo, but slathering on the matching conditioner soon rectifies that and saves the day with a generous shot of hydration. The conditioner has the weightless feel of a gel, but the silkiness of a cream and leaves my mane feeling so slippery and moisturised after rinsing, that I can comb my fingers through it without getting caught in a mess of knots. The biggest difference I've noticed since switching to this new combination, is that it gives my hair mega volume and bounce. After blow-drying, my hair feels so swish; the roots are lifted and the lengths have so much more body. Whilst my hair is well moisturised, it isn't left overloaded, lank or weighed down with greasy residues. Getting used to the lighter combination has also meant I've been able to wash my hair less often. Music to my ears. The only downside of my new routine, is that the Argan Renew products do give my hair a light sheen, but it's not quite as glossy as I'm used to. That's nothing I can't solve with a dose of hair serum/oil, though. The Hair Xpertise Argan Renew Shampoo and Conditioner are £6.49 each for 250ml and available from Superdrug. They're currently on offer for £4.85, so if you fancy trying out this duo, then get them whilst you'll save! 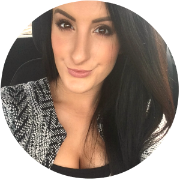 Have you tried any products from Hair Xpertise? Whenever a hair care product has argan oil in it, it catches my attention. This definitely sounds like an awesome shampoo & conditioner. i have never tried these products. they seems interesting.